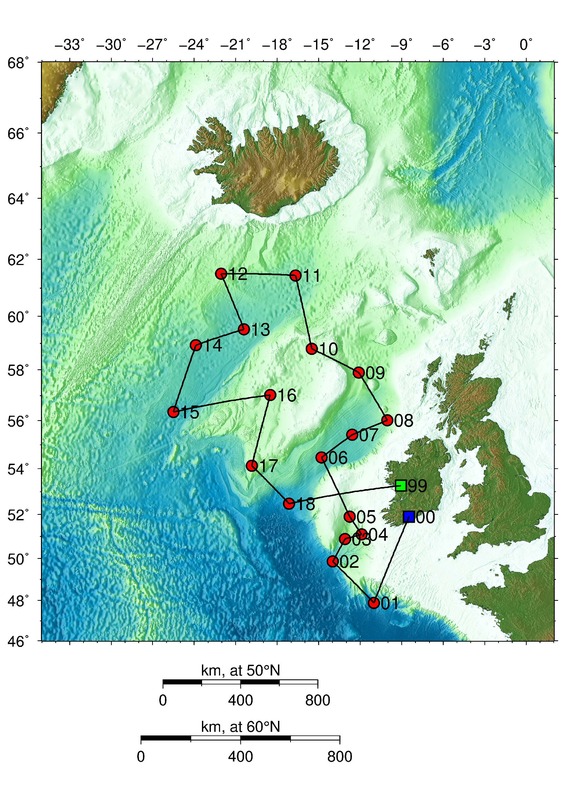 In the project SEA-SEIS (Structure, Evolution And Seismicity of the Irish offshore), scientists from the Dublin Institute for Advanced Studies (DIAS) deployed 18 seismometers at the bottom of the North Atlantic Ocean. The network covers the entire Irish offshore, with a few sensors also in the UK and Iceland’s waters. The ocean-bottom seismometers were deployed on the cruise on the the RV Celtic Explorer between 17 September and 7 October, 2018, and retrieved 18 months later. The ocean-bottom sensors will record the tiny vibrations of the Earth caused by seismic waves, generated by earthquakes and by the ocean waves. As the waves propagate through the Earth’s interior on their way to the seismic stations, they accumulate information on the structure of the Earth that they encounter. Seismologists know how to decode the wiggles on the seismograms to obtain this information. With it, they can do a 3D scan (tomography) of what’s inside the Earth. In this project, they will find out how the structure of the tectonic plate varies from across the North Atlantic and what happens beneath the plates. And is there an enormous hot plume beneath Iceland, responsible for the volcanoes in Iceland today and in the Giant’s Causeway in the past? We hope we’ll find out.